The City of Charlotte, Eaton Township and Carmel Township have developed a Community 5-Year Recreation Plan. This plan provides and inventory of existing resources and identifies opportunities for new facility development to serve residents of the area. 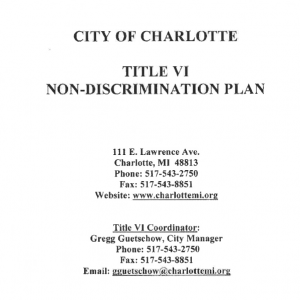 This plan was prepared by the Charlotte Area Recreation Cooperative, an organization with representatives of the three units of government previously mentioned. The Board meets the 2nd Thursday of the month at 7:00 p.m. at Carmel Township Hall, 661 Beech Hwy, Charlotte.